Emma Hardinge was born in 1823 in the East end of London. As a child, Emma could predict coming events and often saw the spirits of dead relatives and family friends. In 1855 Emma first visited America and, at the boarding house where she was living, she met a Spiritualist couple with whom she visited a medium. The spirit communication Emma received there was an experience that changed her entire outlook on life. Emma discovered that she had a mediumship ability for table tipping and wrapping, where spirits made themselves known by table movements and noises. In 1856, Emma held a table séance that spelt out a message from a friend who had died on the ship Pacific. However, this ship had only recently sunk and at the time no one knew. Following this message Emma became well known as a medium and demonstrated several forms of mediumship. She practised her mediumship in the same building along with Miss Kate Fox who was one of the Famous sisters from Hydesville. After a while Emma gave up platform mediumship and seances to concentrate on inspirational speaking about spiritual matters; she would take the platform, pass into a light trance and knew little of what then happened until she again came to herself. Emma travelled throughout America and to many parts of the world giving lectures and inspired addresses on the subject of Modern Spiritualism. By public speaking and prolific writings Emma help to encouraged the formation of many Spiritualist groups, societies and churches throughout the world. The concepts and original wording of the Seven Principles came through Emma’s mediumship as she was inspired in 1871, by the communicating spirit of Robert Owen, to summarise the philosophy of Spiritualism in principles that all Spiritualists would agree. These have since become know as the Seven Principles of Spiritualism. In Britain, attempts were made to bring together the various individuals, Spiritualist churches, groups and societies. The concept of a national federation of Spiritualist churches was discussed and written about in 1889 by Emma Hardinge Britten in the Two Worlds magazine, a publication she had launched in 1887. Emma arranged a meeting in Manchester of interested Spiritualists to discuss the formation of an organisation that could unite Spiritualist churches throughout the United Kingdom. The meeting held on 1st April 1890 agreed to issue a circular giving information and requesting comments from Spiritualist churches, societies and individuals. And in July 1890 a first national conference of Spiritualists was held in Manchester. It seems that Emma Hardinge Britten played a pivotal role in organising and bringing together Spiritualists both by her powerful inspired speaking and her ability to communicate by pen and publish to a wider audience. At the first National Conference in 1890, Emma advocated her concept for the fundamental basis of Spiritualist philosophy which later became the Seven Principles of SNU Spiritualism. Resolutions were carried unanimously that have since shaped the direction of Modern Spiritualism. Emma Hardinge Britten is, perhaps, the most renowned and most respected advocate and proponent in the early Modern Spiritualist Movement. She was the daughter of Captain Floyd Hardinge, whom writers call a seafaring man. Early in her life, she had shown gifts as a musician, singer, and speaker. In fact, at age 11 she was earning her living as a music teacher. Under contract with a theatrical company, she went to America in 1856 where, through the mediumship of Miss Ada Hoyt (Mrs. Coan), she became converted to the Spiritualist philosophy. There, she began developing her own abilities as a medium and sat publicly for the Society for the Diffusion of Spiritual Knowledge of New York (what a wonderful name). As a young medium, she furnished one of the best attested cases of early Spirit return. A member of the crew of the mail steamer, Pacific, which had sunk in the ocean, controlled young Emma and, in trance, disclosed the facts of the tragedy. Because of the nature of the details given through her mediumship, Emma Hardinge was threatened with prosecution by the owners of the boat when the story was made public, but all the details were found to be true and accurate. Her mediumistic gifts embraced automatic and inspirational writing, psychometry, healing, prophecy, and inspirational speaking. She was best known for her inspirational addresses, which were very eloquent, inspiring, and informative. They were given completely extempore, and the subject was generally chosen in the auditorium by a committee from the audience. Most historians agree that, as a propagandist for Spiritualism, she was unequalled in her zeal, commitment, and enthusiasm. For years she travelled all over the United States, Canada, England, Australia, and New Zealand, expounding the truths of Spiritualism and related areas of thought. 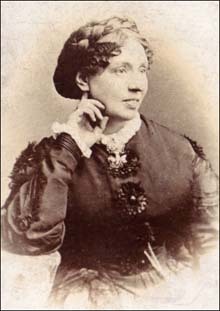 Emma Hardinge Britten founded and edited for five years the Two Worlds of Manchester. She was also among the founders of the Theosophical Society in New York, in 1875. However, she soon severed her connections with Madame Blavatsky. Although she was not alive to see this happen, her dream of establishing a proper and formal “school of prophets” (training school for mediums) was realized in 1900, with the founding of the Britten Memorial Institute and Library, in Manchester, England. Emma Hardinge Britten’s writings include: Modern American Spiritualism, New York, 1870; Nineteenth Century Miracles, New York, 1884; Faith, Fact and Fraud of Religious History, Manchester, 1896; Extemporaneous Addresses, London, 1866. She was editor of the American periodical, The Western Star, 1872, and the British The Unseen Universe, 1992-1893. Her classic, Modern American Spiritualism, is still considered the finest and most complete analysis of the early American Movement. We remember her as a true pioneer and dedicated advocate of Spiritualism.